Average Weight	: 7 - 13 lbs. Following the French, Cuban and Russian revolutions, the Havanese were almost extinct. Now rare in Cuba, the breed has been facing a crisis through the 1900s, but is presently on the rise in popularity, having some dedicated believers in the breed who are actively campaigning for its preservation in the USA. This dog belongs to the family of dogs called Bichons. The French word Bichon Frise means "fleecy dog" or "curly lap dog." "Bichon" refers to the bearded appearance of the breed, as the word "barbichon" means little beard, while the word "Frise" means curly. •	A great companion family dog. Gentle & affectionate. •	Slightly fragile ~ this is not a play rough type of breed. •	Intelligent and fairly easy to train. •	Low shedder, a great choice for allergy suffers. •	Will suffer from separation anxiety if left alone. •	Regular grooming is a must for this breed with a long silky coat. •	Does well in apartments and condos. •	Loves to 'perch' and set himself high ~ like on the back/top of your sofa. •	Clever, playful, this breed can entertain you with their antics. •	Energetic ~ this breed needs and loves long walks, runs, plays in the park ~ they have a lot of energy. Havanese are not prone to excessive barking, but they will bark to alert you to visitors and will be wary of strangers until you have welcomed them. Once the dog observes that you're comfortable with a visitor, however, he will be very friendly. These dogs are not prone to shyness. And, despite their size, they do not show any fear. Their combination of friendliness, eagerness to please and comfort will all kinds of people and animals makes this one of the best dogs, particularly for families with allergies or who need a small pet. Havanese are prone to a variety of Health Problems. They are particularly prone to Cataracts, and these often develop before the dogs have reached a truly advanced age. They often have dry skin and can require treatment to prevent severe itching. They are also prone to patellar luxation and Progressive Retinal Atrophy. PRA is a genetic, inherited disease of the retina (the "film" in the camera), which occurs in both eyes simultaneously. The disease is not painful, and there is no cure for it. The eyes are genetically programmed to go blind. Most Havanese that develop PRA do so later in life, but it can be found at earlier ages as well. The first signs of PRA include poor vision at night or during low light conditions. The Havanese has a fairly long coat that does not shed. However, it can become easily tangled and must be brushed daily to keep it from matting. If your Havanese is not to be shown, you can keep the coat clipped short to make grooming much easier. However, keep in mind that the Havanese's coat was designed to protect him from the heat, so you should not clip his coat very short if he is to be left outdoors during hot weather, as he will actually be hotter. Though the Havanese naturally has a long and wooly looking coat, it is designed to protect from heat, not from cold, so this dog is not designed to spend long periods of time out in the cold, either. 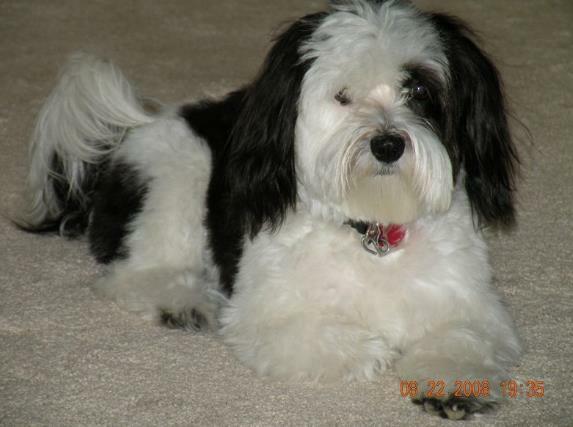 However, since most Havanese dogs live primarily indoors with their families, a short coat is far more practical. The Havanese is designed to have a natural appearance in his coat. The very long hair around the feet, however, can be clipped. The Havanese needs a moderate amount of exercise. They are quite energetic, but are small enough to be able to run off some of their energy in the house. They'll be quite happy with a small yard area where they can run around some each day. They can also get sufficient exercise from accompanying their owner on a daily walk. The Havanese is well suited to living indoors, though they are a very active breed. They will be happiest indoors where they can be part of the family, but they will do best with an outdoor area where they can be allowed to run off some of their energy. This dog doesn't shed and tends to be hypoallergenic, so they make a great house pet, even for allergy sufferers. However, since some people with severe allergies can still have a reaction to the dander of the Havanese, it's wise to spend some time with one before you bring it into your home to live if you're an allergy sufferer. The Havanese is very intelligent and eager to please. These two qualities make them quite easy to train. They are eager to do tricks to entertain you, so once you've completed the basics of training, they'll be eager to learn some fun tricks. They have an exceptionally good sense of smell and will love to play games of "find" where you hide an object and they hunt it down. Your Havanese should be very easy to house train, as they will quickly understand your displeasure when they use the bathroom indoors. Because of their size and sensitivity to the cold, many owners choose to paper train their Havanese if they live in a very cold climate. This allows them to avoid sending the dog outside in cold weather and snow. Whichever method of house training you choose will work well with a Havanese. Havanese are said to never eat alone. This is because they want to always be in the same room with their owners. So, if your Havanese is eating and you leave the room, you can expect him to follow you, likely with food in his mouth, which he will drop on the floor and eat. This can be a bit annoying, so many owners have a set feeding time for their Havanese, and only have food available at this time. Then, they either confine the dog to the room where the food is waiting, or stay in the room with the dog while he eats. Whenever you're training a puppy, use a firm voice for commands and admonishments is important, as your dog will respond to the firmness in your voice. However, it is very important that you not be too harsh in speaking to your Havanese, as it will only frighten him and make it difficult to accomplish any training results.